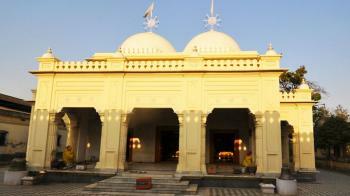 The temple was built in 1846 in the reign of Maharaja Nara Singh and rebuilt by Maharaja Chandrakriti in 1876. The temple management was earlier with the former king as per Article II of the Manipur Merger Agreement of 1949 when Manipur became a part of India after independence. However, on popular demand by the public, it is now managed by a Board with members drawn from the priest community and important people of the city. The Chief Minister of the state is the Board's president. On 16 January 1846, Maharaja Nara singh of the Manipur kingdom commissioned the temple and dedicated it to Shree Govindaji, which was their royal deity. The temple and the deities were substantially damaged during an earthquake of 1868. The temple was rebuilt to its original design during the reign of Maharaja Chandrakriti (1859-1886) and was consecrated on 26 April 1876. It is also said that Maharaja Jai Singh or Bhagya Chandra Karta (1763–1798), who was an ardent devotee of Lord Krishna, received an epiphany from the Lord to build a temple for him. He formally initiated the carving of the idol of the Lord Govindaji, in 1776, which was then completed and consecrated in November 1779 on the full moon day in a temple built by him in his palace. On this occasion Ras Lila was performed for five days at Raas Mandal Pukhri at Langthabal. The temple is built in an idyllic location with a well tended garden surrounding the premises. There is a small pond in the vicinity of the temple, and also a large open space where a row of tall trees are planted along the boundary. The sanctum is compartmentalized with two short walls. The outer chamber and the porch are built with huge columns in an arcade system where the walls above the arches rise up to the cornice. he first row of railings is provided above the cornice, in front of the portico roof, over the Pradakshina path. At the four corners of the railings small shrines called "Salas" are built. A second row of railing, at a higher level, is provided around the two domes. The temple entrance faces east. The temple is built with brick and mortar. The images of Govindaji and Radha are first carved out of special wood and with the remaining wood images of Jagannath, Subhadra and Balabhadra are made. Images of Krishna and Balarama are, however, made of plaster of paris in attractive colorful shades. By Air - The nearest airport to the temple is Imphal Airport. By Rail - The nearest Railway Station near temple is Dimapur Railway Station. By Road - Imphal is connected by road with Guwahati through National Highway No. 39 and Silchar through National Highway No. 53.